1. Spray 2 mini muffin trays with non stick oil. 2. In a small bowl, whisk together the eggs and yogurt. 3. Add the cheese and chives. 4. 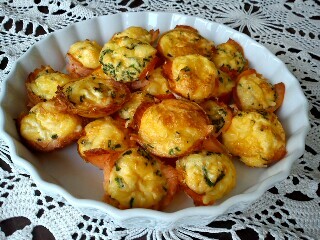 Cut each smoked salmon piece in half and use it to line the mini muffin holes. 5. Ladle in the egg mixture. 6. Add a bit more cheese on top. 7. Bake in a 170 degree celsius oven for 15-20 mins until golden brown. 8. Leave to cool a while before removing from pans. I offered to take an appetiser to the party we are going to tonight, so thought I'd try something new. I've SCD'd this recipe that originated at Taste.com.